Mesh class is a container and provides an interface for mesh loading, manipulating and saving. A bind pose transformation is stored for each mesh (even if there are no animations and animation frames). See also the getBoneTransfroms() method. Each coordinate vertex contains coordinates ( float) of the vertex. Constructor. 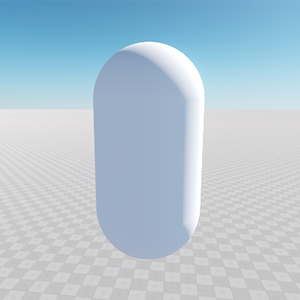 Creates an empty mesh. Constructor. Creates a mesh with the specified name. const Ptr<Mesh> & mesh - Mesh instance. Copies bones from the given array to the current array of animation bones. const Vector< short > & bones - Array of bones taking part in the animation to be set. Adds all bones of the given animation to the given array of bones. Vector< short > & bones - Array with indices of bones taking part in the animation. Updates the animation frame coordinates, rotation quaternions and scaling vectors. int num - Frame number in the array of the animation frames. const Vector< Math::vec3 > & xyz - Array with coordinates of the animation frame. const Vector< Math::quat > & rot - Array with rotation quaternions of the animation frame. const Vector< Math::vec3 > & scale - Array with scaling vectors of the animation frame. const Vector< Math::mat4 > & frames - Matrix that includes coordinates, rotation quaternions and scaling vectors of the animation frame. Adds the animation frame coordinates, rotation quaternions and scaling vectors to the given matrix passed to the function as the third argument. The matrix can be set by using the setAnimationFrame() method. Vector< Math::vec3 > & xyz - Array with coordinates of the animation frame. Vector< Math::quat > & rot - Array with rotation quaternions of the animation frame. Vector< Math::vec3 > & scale - Array with scaling vectors of the animation frame. Vector< Math::mat4 > & frames - Matrix that includes coordinates, rotation quaternions and scaling vectors of the animation frame. Sets a name for the given animation. const char * name - Animation name to be set. Returns the name of the given animation. Sets a name for the given bone. const char * name - Bone name to be set. Sets the parent bone for the given one. int bone - Bone number, for which the parent bone should be set. int parent - Bone to be set as a parent. Returns the number of the parent bone of the given one. int bone - Bone number, for which the parent bone will be returned. Sets the transformation matrix for the given bone. const Math::mat4 & transform - Transformation matrix to be set. Returns the transformation matrix for the given bone. Updates the array of the world-space transformation matrices for bones of the given animation frame. If the passed animation number is -1, the bind pose will be updated to the given array. const Vector< Math::mat4 > & transforms - Array of transformation matrices to be set. Its size must be equal to the number of animation bones. int animation - Animation number. The default value is -1.
int frame - Animation frame number. The default value is 0. Returns 1 if the array of bones' transformations is updated successfully; otherwise, 0. Appends the world-space transformation matrices for bones of the given animation frame to the given array. If the passed animation number is -1, the bind pose will be added to the given array. The number of array elements must be equal to the number of animation bones. Vector< Math::mat4 > & transforms - Array of transformation matrices. Returns 1 if the array of bones' transformations is filled successfully; otherwise, 0. 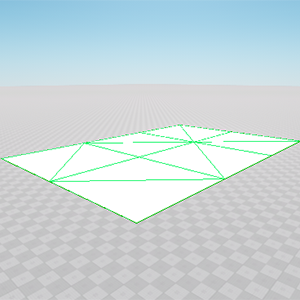 Sets the bounding box for the given mesh surface. const BoundBox & bb - Bounding box to be set. 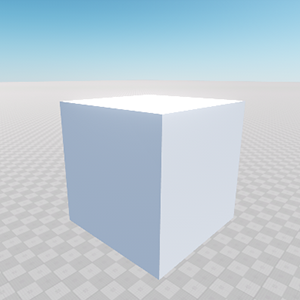 Returns the bounding box of the given mesh surface. 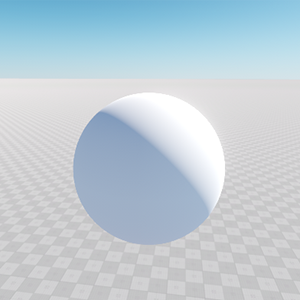 Sets the bounding sphere for the given mesh surface. const BoundSphere & bs - Bounding sphere to be set. Returns the bounding sphere of the given surface. Returns the bounding sphere of the given mesh surface. Sets both coordinate and triangle indices for the given vertex of the given surface equal to the specified index. int num - Vertex number in the range from 0 to the total number of coordinate indices of the given surface. To get the total number of coordinate indices for the surface, use the getNumCIndices() method. int index - Index to be set in the range from 0 to the total number of coordinate vertices. To get the total number of coordinate vertices, use the getNumVertex() method. Returns the coordinate index of the given vertex of the given surface if the coordinate index is equal to the triangle index. Performs the search for the intersection of the given surface target with the given traced line. Mesh local space coordinates are used for this method. const Math::vec3 & p0 - Start point coordinates. const Math::vec3 & p1 - End point coordinates. Math::vec3 * ret_point - Return array to write the intersection point coordinates into. Math::vec3 * ret_normal - Return array to write the intersection point normal into. int * ret_index - Return array to write the intersection point indices into. 1 if the intersection is found; otherwise, 0. Sets the normal for the given triangle vertex of the given surface target. The normal of the vertex won't be written to the *.mesh file. It will be stored only in memory. int num - Triangle vertex number in the range from 0 to the total number of vertex normal entries of the given surface target. To get the total number of vertex normal entries for the surface target, call the getNumNormals() method. const Math::vec3 & normal - Normal to be set. Sets the number of animation frames for the given animation. int animation - Animation number in the range from 0 to the total number of mesh animations. To get the total number of mesh animations, call the getNumAnimations() method. int num - Number of the animation frames to be set. Returns the number of animation frames for the given animation. Number of the animation frames. Returns the total number of mesh animations. Number of the mesh animations. Returns the total number of mesh bones. Number of the mesh bones. Sets the total number of coordinate indices for the given surface. int size - Number of the coordinate indices to be set. Returns the total number of coordinate indices for the given surface. Sets the total number of vertex color entries for the given surface. int size - Number of vertex color entries to be set. Returns the number of coordinate vertices of the given surface. Sets the number of indices for the given surface: updates the number of coordinate and triangle indices. For example, if you pass 5 as the first argument, the number of the coordinate indices and the number of triangle indices will be set to 5.
int size - Number of indices to be set. Returns the number of coordinate indices of the given surface if the number of the coordinate indices is equal to the number of triangle indices. Sets the total number of vertex normal entries for the given surface target. 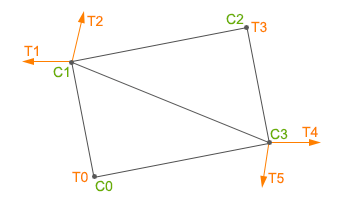 Normals are specified for triangle vertices. int size - Number of vertex normal entries to be set. Returns the total number of vertex normal entries for the given surface target. Number of vertex normal entries. Returns the total number of mesh surfaces. Sets the number of targets for the given mesh surface. int num - Number of surface targets to be set. Returns the number of surface targets for the given surface. Sets the total number of vertex tangent entries for the given surface target. int size - Number of vertex tangent entries to be set. Returns the total number of vertex tangent entries for the given surface target. Number of vertex tangent entries. Sets the total number of the first UV map texture coordinate entries for the given mesh surface. int size - Number of the first UV map texture coordinate entries to be set. Returns the total number of the first UV map texture coordinate entries for the given mesh surface. Total number of the first UV map texture coordinate entries. Sets the total number of the second UV map texture coordinate entries for the given mesh surface. int size - Number of the second UV map texture coordinates to be set. Returns the total number of the second UV map texture coordinate entries for the given mesh surface. Total number of the second UV map texture coordinate entries. Sets the total number of triangle indices for the given surface. int size - Number of triangle indices to be set. Returns the total number of triangle indices for the given surface. 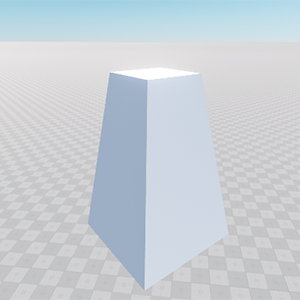 Returns the number of triangle vertices for the given mesh surface. Number of the triangle vertices. Sets the total number of vertices for the given surface target. The numbers of vertices and coordinate vertices are equal. int size - Number of the vertices to be set. Returns the total number of vertices for the given surface target. Sets the number of weights set for vertices of the given surface. Weights are specified for coordinate vertices. int size - Number of weights to be set. Returns the number of weights set for vertices of the given surface. Sets the name for the given mesh surface. const char * name - Surface name to be set. Returns the name of the given surface. Sets the name for the given surface target. int target - Surface target number. const char * name - Surface target name to be set. Returns the name of the given surface target. Sets the transformation matrix for the given surface target. int surface - Mesh surface number. The default value is -1 (apply to all of the mesh surfaces). If all surfaces are chosen, the transformations of bones and animations will also be recalculated. int target - Surface target number. The default value is -1 (apply to all of the surface targets). 1 if the transformation matrix is set successfully; otherwise, 0. Sets the vector of bone indices that affect the vertex with the given weight. Number of weights (see setWeightCount() / getWeightCount() methods). int num - Coordinate vertex number in the range from 0 to the total number of vertex weight entries for the given surface. To get the total number of of vertex weight entries for the given surface, use the getNumWeights() method. const Math::ivec4 & bones - Vector of the bone indices to be set. Returns a vector of bone indices that affect the vertex with the given weight. Vector of the bone indices associated with the given weight. Sets the number of weights that affect the vertex with the given weight. int count - Number of weights to be set. Returns the number of weights that affect the vertex with the given weight. Sets the vector of bone weights that affect the vertex with the given weight. const Math::vec4 & weights - Vector of bone weights to be set. Returns a vector of bone weights that affect the vertex with the given weight. Bone weights associated with the given weight. Appends an animation with a given name to the current mesh. const char * name - Name of the animation. This argument is empty by default. Appends a new mesh bone. const char * name - Bone name. This argument is empty by default. int parent - Parent bone number. The default value is -1 (the new bone has no parent bone). Appends a box surface to the current mesh. After adding to the editor, the mesh will appear. Appends a capsule surface to the current mesh. The stacks and slices specify the surface's subdivision. // add capsule surface with the name "capsule_surface". Appends a new Coordinate index the array of coordinate indices for the given surface. int index - Coordinate index to be added in the range from 0 to the total number of coordinate vertices. Appends the given color to the vertex color array of the given surface. const Math::vec4 & color - Color to be added. Appends a cylinder surface to the current mesh. The stacks and slices specify the surface's subdivision. 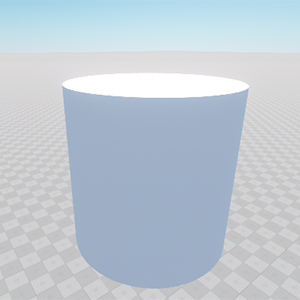 // add cylinder surface with the name "cylinder_surface". Appends a dodecahedron surface to the current mesh. 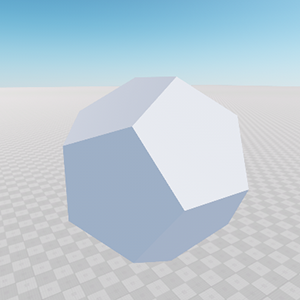 // add dodecahedron surface with the name "dodecahedron_surface". This function allocates only vertex and index arrays. Texture coordinates, tangent basis, weights and color arrays must be allocated manually. int num_vertex - Number of surface vertices. int num_indices - Number of surface indices. Number of the mesh surfaces. Appends a icosahedron surface to the current mesh. 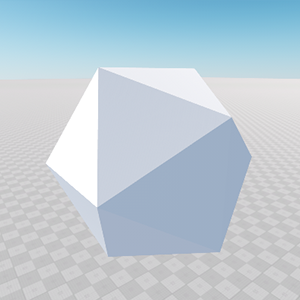 // add icosahedron surface with the name "icosahedron_surface". Appends a given index to the arrays of coordinate and triangle indices for the given surface. int index - Index to be added in the range from 0 to the total number of coordinate vertices for the surface. To get the total number of coordinate vertices for the surface, use the getNumCVertex() method. Appends a surface of the source mesh to the current mesh as a new surface. The following example shows how to add a surface from the one mesh to another. const char * v - Name of the new surface added to the current mesh. int target - Number of the target of the source mesh surface. The default value is -1 (all of the surface targets). Appends a surface of the source mesh to the existing surface of the current mesh. int v - Number of the existing surface of the current mesh, to which the geometry is added. Appends a given normal to the array of normals of the given surface target. const Math::vec3 & normal - Normal to be added. Appends a plane surface to the current mesh. The plane is divided into equal squares whose size is defined by the given step. // add the plane surface with the name "plane_surface". After adding to the editor, the mesh will appear. You could see that the plane divided each 1 unit to equal squares. Appends a prism surface to the current mesh. // add the prism surface with the name "prism_surface". Appends a sphere surface to the current mesh. The stacks and slices specify the surface's subdivision. // add the sphere surface with the name "sphere_surface". Append a new surface with the given name to the current mesh. In the following example, we create a new surface and add vertices and indices to create a plane. const char * name - Surface name. This argument is empty by default. Appends a target with the given name to the given surface. const char * name - Name of the surface target. This argument is empty by default. Appends the given tangent to the array of tangents of the specified surface target. const Math::quat & tangent - Tangent to be added. Appends texture coordinates to the array of the first UV map coordinates of the given mesh surface. const Math::vec2 & texcoord - Coordinates of the first UV map to be added. Appends texture coordinates to the array of the second UV map coordinates of the given mesh surface. const Math::vec2 & texcoord - Coordinates of the second UV map to be added. Appends an index of a triangle vertex to the array of triangle indices for the given surface. int index - Index number of the vertex in the triangle buffer in the range from 0 to the total number of triangle vertices. int surface - Number of the surface to which the triangle index is added. Appends a new coordinate vertex with the given coordinates to the mesh surface. In the following example, we create a new surface and add 4 vertices to it. We use local coordinates to define a vertex and specify the surface. After that we specify 6 indices to create a plane by using defined vertices. const Math::vec3 & vertex - Coordinates of the vertex to be added. Clears the mesh (including its bones, animation, surfaces and bounds). 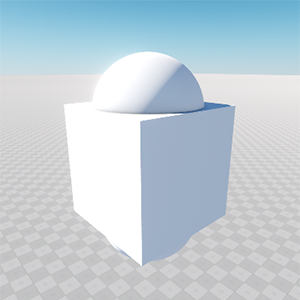 Creates bounds (a bounding box and a bounding sphere) for the given surface. If the default value is used as an argument, the bounds will be created for all of the mesh surfaces. int surface - Mesh surface number. The default value is -1 (all of the mesh surfaces). 1 if bounds are created successfully; otherwise, 0. Creates indices for the given surface. If the default value is used as an argument, the indices will be created for all of the mesh surfaces. 1 if indices are created successfully; otherwise, 0. Calculates a potentially visible set for the given surface. This function prepares the mesh for working with getIntersection() method. 1 if the potentially visible set is calculated successfully; otherwise, 0. Creates normals for the given surface target. int target - Surface target number. The default value is -1 (all of the surface targets). 1 if the normals are created successfully; otherwise, 0.
float angle - Angle between normals used to calculate the mean vertex normal. int surface - Mesh surface number. -1 means all of the mesh surfaces. int target - Surface target number. -1 means all of the surface targets. Creates tangents for the given surface target. 1 if the tangents are created successfully; otherwise, 0. Creates tangents for all of the surfaces in the list. const Vector< int > & surfaces - List of surface numbers, for which tangents are to be created. Searches for the animation by the name and returns its number. const char * name - Name of the animation. Searches for a bone with a given name and returns its number. Searches for the surface number by its name. const char * name - Mesh surface name. Mesh surface number, if it is found; otherwise, -1. Searches for the surface target number by the morph target name. Target number, if exists; otherwise, -1. Flips the sign of the binormal component of the surface tangent space. 1 if the sign of the binormal component is flipped successfully; otherwise, 0. 1 if the axes are flipped successfully; otherwise, 0. Sets the owner flag to 1 for the Mesh pointer. Returns an information about the given mesh or animation. const char * name - Mesh or animation name. Loads the mesh with the given name for the current mesh. Optimizes indices of the given mesh surface. As polygons are added to a surface, vertices of the adjacent polygons are duplicated (you can get the number of such the vertices by using the getNumTVertex()), because normals, texture coordinates and tangents of such the vertices differ depending on the polygons, to which this vertices belongs. The optimizeIndices() function serves to decrease the number of such vertices and create indices for them that will be stored in the corresponding normals, tangents and texture coordinates. int flags - One of the flags used for indices' optimization: MESH_BACK_TO_FRONT or MESH_VERTEX_CACHE. 1 if the indices are optimized successfully; otherwise, 0. Sets the owner flag to 0 for the Mesh pointer. Sets the size of the array of coordinate indices to be equal to the size of the array of triangle indices and increases the size of the vertex buffer to the size of the array of triangle vertices by using the coordinate vertex duplicating. 1 if indices are copied successfully; otherwise, 0. Clears the coordinate and triangle indices of the given surface. int surface - The mesh surface number. -1 means all of the mesh surfaces. 1 if the indices were cleared successfully; otherwise, 0. Sort all animations by their names. Sort all surfaces by their names. Flag, which is used for mesh indices optimization. If this flag is set, polygons will be rendered in back-to-front order (from the exterior polygons to the central polygons of the mesh).